So if it’s not actually soup, what is it? See also: The “Blog” of “Unnecessary” Quotation Marks. 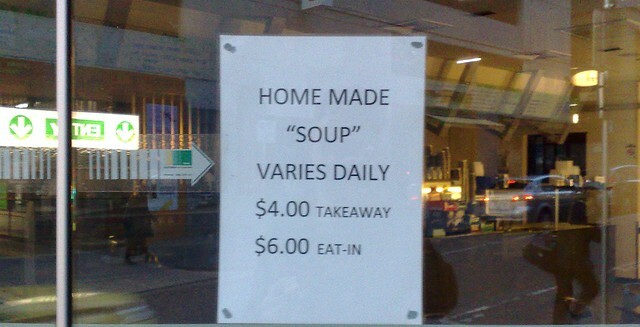 I reckon the quote marks should be around the “home made”, because that soup obvioulsy ain’t! one has to wonder what it is if it isn’t “soup” ..
Maybe it’s Krusty brand imitation soup? Seems a lot of these are mistaking quotation marks for bold. Better if they underlined or, well bolded the word for emphasis.